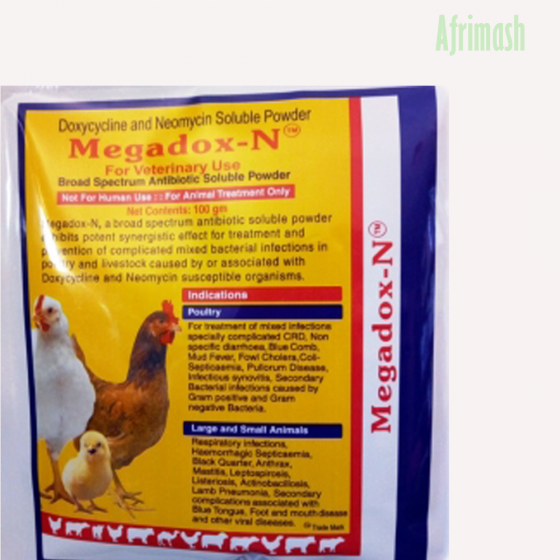 Megadox-N is a broad spectrum antibiotic soluble powder which exhibits a potent synergistic effect in the treatment and prevention of complicated mixed bacterial infections in poultry and livestock caused by or associated with Doxycycline and Neomycin susceptible organisms. It is recommended for the treatment of mixed infections specifically complicated CRD, non-specific diarrhoea, Blue comb, Fowl cholera, Mud fever, Colisepticemia, Pullorum disease, Infectious synovitis, and other secondary bacterial infections. It is indicated for the treatment of Respiratory infections, Hemorrhagic septicemia, Black quarter, Anthrax, Mastitis, Leptospirosis, Actinobacillosis, Lamb pneumonia, and other secondary bacterial infections in livestock generally. 10-20mg per kg of body weight orally for 5-7 days.